Do we have to do the update if we are not going to link up our cartridges? @dmcardmaker - If you don't want to link your carts your Expression firmware can be 2.34 - not 2.43. 2.34 will allow you to cut but not link. @Nancy - this only applies to the Expression, not the E2. 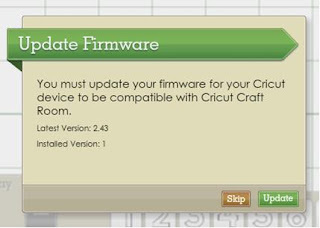 Are you doing your E2 update using the latest version of Cricut Sync (v2.1.12)? thanks to you, i updated my firmware on my expression, and create. the mini was hooked up when i upgraded the new CCR. one question. how do i update my firmware on the expression 2? thanks for your help, and i will most definately send my friends your way. You use Cricut Sync to to update the firmware on your E2. I haven't been on my cricut expression for a month or so (when I last used it, it was fine). 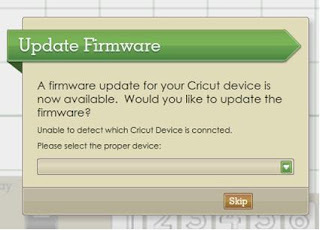 I opened my CCR and it advised me to update the firmware. I tried to do this which took over 5 hours = for some reason. Eventually it completed the update, but now the machine keeps jumping, bleeping and then stopping cutting what I have asked it to and then unloading the mat. This happens in the CCR as well as using the cartriges alone. I telephoned the support number in America and they took me through the process of resetting my machine. Unfortunately this has not helped and they have advised that there is nothing more that can be done and that I would have to buy a new machine. I am quite upset that this has happened - was it due to the update? Any help would be appreciated. Do I dump the machine or can they be fixed/ refurbished? - does anyone else have any ideas or is this really the end of my machined ( it is about 5 years old). Thanks Narelle - I tried this again, it did update in no time however my machine is still switching itself off and on and not doing the cuts as I have asked or doing a cut, stopping and then unloading the paper. Do you think that it is the machine that is faulty? have you heard of any other machines doing this? I've not heard of a firmware update causing that problem with the Expression. That's not to say that it hasn't happened though. At 5 years of age I'm wondering whether the power supply might be on its way out. Do you have a laptop that uses a similar type of power supply? My Asus laptop and my sons Toshiba laptop both have a power supply that works with my Expression. It's certainly worth a try. OMG - you were bang on with it - it was my power supply, I swapped it with my computer and it is working fine now - thank you ever so much with all your help. I am so glad I fell upon this blog. Hi there... Do you recommend updating with a Mac or PC? Hi! I have the Cricut Expression 2 Anniversary Edition. I am going to admit that I gave up trying to use it, when I first bought it, after a few weeks. I could not get it to work for me. It worked for my BFF; when she came over to use it, for some project. Anyway, it just decorated my Craft Room, for over a year. I was given the Cricut Mini, as an early Christmas Gift, from my girls. So ,I decided to give my CE2 another go; however, the Cricut Sync keeps going on,and on, saying that it is connecting to my Cricut. The Cricut showed a connection, right away. The Cricut Mini, also, would not work. The link that I was supposed to run, http:www.crict.com/usemini, kept coming up as an error, stating that it was not configured, correctly. I waited for Monday, and got in touch with support. First, he could not figure out, anything; after having me do certain things. Then, I allowed him to do remote. He, instantly, saw that my CCR was 'beta.' I forgot that I was one of the 'beta' participants. So, he deleted the beta CCR; and installed the updated one. However, it did not take care of the Cricut Sync problem. It did the same thing. And, yes, before I, even, contacted support, I tried using different ports. When he found out, I had disabled my anti-virus (I was worrying because it was off for so long); he had me turn it back on, and helped me (because I had tried earlier, but, didn't know which files to put) tell my anti-virus, which files to allow. My Cricut lync still didn't work. He, finally, told me to allow it to go for awhile (obviously, got tired of trying); and then to contact him, today (Tuesday), again ... if it didn't work. It doesn't. All day I worked on it, did a lot of surfing, and reading ... then learned about the Firmware. My Cricut's firmware is 1.01 (Hey, I haven't did anything with it, for over a year); so, I want to update it, to see if I will, then, be able to do the Cricut Sync, next time I need to update. Can you tell me how to update my CE2, another way? Because the Cricut Sync will not work, on my computer; and with my CE2. I figure it is because the Expressions Firmware is too old. Please, be able to tell me that there is another way,to update it. Thank you. P.S. Yes, after I finished with support; I tried the Cricut Mini, again; and because of the right CCR being installed,it worked, beautifully! I love my mini cricut! Hi, i'm very frustrated, I'm trying to have the CCR print to my CE2 and I can't seem to find my printer, does anyone have any insight on how to make it work? Hi I'm trying to update my new E2 using Cricut Sync but it always loops to the detection of the device. When I connect my E2 using the usb cable to my computer, I keep hearing this beeping sound. I've looked into this already and tried some of the suggestions I found on the forums ie: restarting laptop/computer. I'm at a lost on how complicated installing this thing and why it did not include any sort of CD/DVD for all the drivers and manual. I just need some help, if you have an idea It'd be great. About how long is it between the first and second beep? I held the STOP button for 10 minutes before i finally gave up. Should it take this long? I get step 7 screen when my expression says v2.43, Why? I update successfully but still get the screen, Why? Thank you so much for your tips and help...they got me going again! I am very new to the Cricut CRV001. I bought it used but it worked great, until I tried to use the CCR and update the firmware. The firmware never would go through the last phase and now my machine lights are locked into update mode. Is there anyway I can reset my machine. Thanks for any help! Once you have DS installed open it, say Yes to continue in trial mode then go to the Help menu and select Update Cricut Firmware. Remember to start the update with the Cricut turned off. It will tell you when to put it in update mode. It may have you do the update twice. If that works the firmware will be updated to 1.34. You should then be able to use CCR to update it to 1.45. Design Studio is not Mac compatible so hopefully you have a PC. If none of that works I'd suggest you give PC a call so they can walk you through some more troubleshooting options. Hi, I just tried to sync my expressions 2 with my pc and now my Cricut is frozen on the first screen. What should I do? Any help will be appreciated greatly! Thanks! HELP! I canNOT update the firmware on my MAC OS X Yosemite 10.10.2. I get the message "no usable devices are available". then when I click on Expression I get the message to update the firmware. I have gone through the process 4 times only to find "FAILURE" displayed when it's finished. What in the world am I doing wrong? When I go to Support, there is only info about the Explore. HELP! PLEASE! Hello Jan in Tucson. I have the exact same problem as you. Did you find a fix? Anyone know how to uninstall a firmware update? I have a CRV001 I never used and I updated the firmware in CCR, which wasn't easy to find. I was all excited to try SCAL2 and just my luck, once I was ready to cut a box says it won't work in V.1.45. How can I roll it back? Thanks so much for any help. How long does it take for the second beep? Every time I turn on Cricut Craft Room to make a quick cut, it tells me I have to do a Firmware upgrade. It puts me off using the Cricut at all! How do I stop this? You're the only place I could find information about my Cricut Expression and you did a great job explaining how to update my machine! Thank you very very much!! *sigh*....I also have a Mac running Yosemite. Had not used the expression in a couple of months. Plugged in and used it ONE time perfectly, then got the update message. I go through ALL of the steps and then get to last one and get the FAILURE message just like Jan in Tucson. Has anyone figured it out? I have the same issue! I wish I could figure out how to fix it! Do anyone get an answer in this site?? I have the same problem with my expression 2 and I see no answers to previously asked same problem with firmware updates. I have a very old Cricut Expression. I downloaded the Craft room program and went about doing the firmware update. After approximately 10 attempts, every single update resulted in a "failure" message. Customer Service provided me with reset instructions which I also found online, but nothing works. My machine is stuck in firmware update mode and now useless until I find a solution. I'm hoping for a response. PLEASE! just spoke to support they said to right click on the craft room icon- go to properties, then click on windows 7 compatibility mode and apply. should work... however i just tried and for some reason the E2 screen shows being connected- but then I get a notification that says lost expression connection?! I updated firmware today... on hold with support again now. My E2 keeps trying to calibrate. I have tried to update the firmware, restore and hard reset, but always get stuck at the calibration. It will let me go through the first cross hairs in the upper left corner, but will not let me go through the second cross hairs at the lower left corner. No matter what I do, it always gets to this point and stops. Any ideas would be helpful as the cricut people were not and their only answer was to buy a new one. Help! This was brilliantly helpful! I couldn't get CCR to recognize my Expression... and now it does! THANK YOU!!! Sorry Tracey, other than what you have already done (reset etc) I can't think of anything. :( I'm guessing you already did the troubleshooting steps using Cricut Sync?